Swiss Family Treehouse is a walk-through attraction based on the 1960 Disney movie Swiss Family Robinson (which itself was based on the 1812 Johann David Wyss book by the same name). The enormous treehouse, situated near the entrance to Adventureland, recreates the arboreal home that the fictional Robinson family built following their shipwreck in the East Indies. Embark on a breezy walk-though tour of the Robinson’s famous home nestled high inside a towering tree. Cross a bridge at the foot of a large leafy tree and climb handcrafted wooden stairs as you explore the famed living quarters of the Swiss Family Robinson and learn of their island adventure. Mahogany furniture, dishware and an organ mingle alongside the large wheel from the shipwrecked Swallow ship. A clamshell sink, a volcanic stone hearth and oven, and a table with benches are just some of the more modern conveniences you’ll see. See the living quarters of sons Fritz, Ernst and Francis, complete with hammocks, a ragged chest and strewn clothing. Home to antique books, a desk, a handmade bamboo chair and a lantern, this is where the Robinsons came to feed their minds and their souls. Boasting panoramic views from the top of the tree, this perch provided the Robinsons with serenity during their stay on the island. At the base of the tree, a large wooden wheel gathers water from a stream and carries it up to the various rooms inside the treehouse. 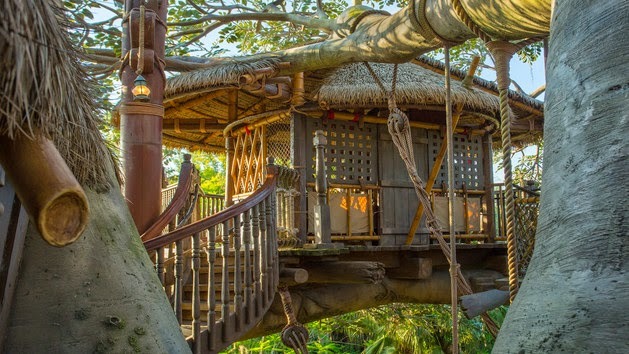 Those who reach the summit of the treehouse will enjoy 360-degree views of Adventureland and Magic Kingdom park, particularly the river on which the Jungle Cruise boats sail. At over 6 stories high, it’s a spectacular sight to see! ...and the castle and Space Mountain, from high atop the treehouse. A treehouse library? Sign me up. Take your time and stroll at a leisurely pace through this attraction; it's worth it. This never used to be a busy attraction, but with the way things have been going lately, you never know when you might run into a unexpected crowd. This is not one where you want to have other people right in front of you or right behind. If there's a crowd, I advise returning at another time. Oh, and an added bonus? If all that climbing around leaves you in need of refreshment, the exit will deposit you in the perfect place to grab a Dole Whip! When is the last time you visited the Swiss Family Treehouse? I sooooo agree! It's a fantastic balance to the high tech wonders in the rest of the park. Great photos! Thanks- but a skilled photographer I am not! This was definitely one of the times I wished I had a better camera, and the know-how to go along with it! This attraction is perfect for getting some really interesting shots. Dole Whip is the best - especially on a hot summer day as you are cooling off inside the Tiki Room!